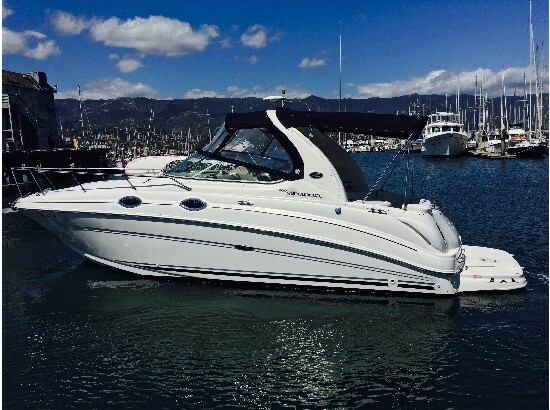 Great reliable '91 Sea Ray Bow Rider (SeaRay Bowrider) Limited ski boat with sun deck for up to six people. Rare and powerful boat that is easy to handle and trailer. 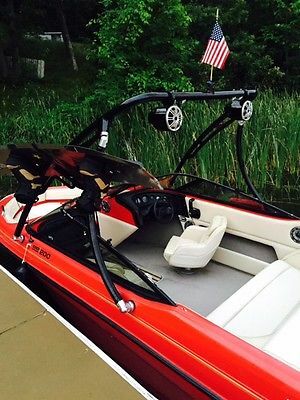 Great for pulling skiers and tubers in comfort with comfortable bench seating, swiveling captain chairs and swim platform with ladder. Newer interior has cooler and glove box to keep items in. Plentiful under seat, side pocket and below the sundeck storage (even accommodates water skis). Very fast boat with the upgraded V-6 175 H.P. Mercruiser I/O with Alpha One Gen II Outdrive. Quiet boat with though outdrive exhaust. Boat comes with a four blade 23P propeller for cruising. Outdrive has new impeller and has been pressure tested. New shift cable installed in July. Trailering is simple with included Shore Lander trailer with all lights functioning and bright. Boat sits low in the trailer for great stability. Trailer fits in most garages for easy indoor storage. Great boat for sporting and cruising with low operating costs with a high performance level. Boat also has soft bow cover and full convertible soft cockpit cover. Contact me for additional info and photos. 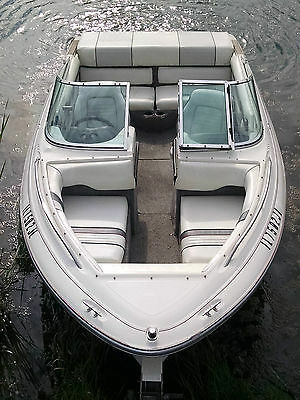 Great reliable '91 Sea Ray Bow Rider (SeaRay Bowrider) Limited ski boat with sun deck for up to six people. Rare and powerful boat that is easy to handle and trailer. Great for pulling skiers and tubers in comfort with comfortable bench seating, swiveling captain chairs and swim platform with ladder. Newer interior has cooler and glove box to keep items in. Plentiful under seat, side pocket and below the sundeck storage (even accommodates water skis). Very fast boat with the upgraded V-6 175 H.P. Mercruiser I/O with Alpha One Gen II Outdrive. Quiet boat with though outdrive exhaust. Boat comes with a four blade 23P propeller for cruising. Outdrive has new impeller and has been pressure tested. New shift cable installed in July. Trailering is simple with included Shore Lander trailer with all lights functioning and bright. Boat sits low in the trailer for great stability. Great boat for sporting and cruising with low operating costs with a high performance level. Boat also has soft bow cover and full convertible soft cockpit cover. Contact me for additional info and photos. 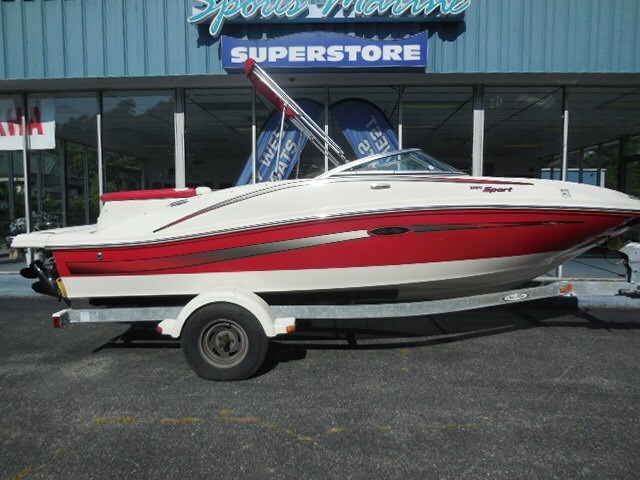 Up for sale is a 2004 Bayliner 185 BR, powered by a 3.0 Mercruiser 135hp mated to an Alpha One Gen II outdrive. I am the second owner of the boat, and picked it up from the original owner in Michigan. He used it exclusively on Lake Huron, so it has seen only freshwater use until this year. I am selling because my wife and I want to move to something with a cabin. In addition to standard features for this model, this boat is also equipped with a depth finder, a 25-watt permanently mounted VHF radio, and Smart Tabs (a strut-based “automatic” trim tab system). I am also including all Coast Guard required equipment so that you will be “water legal” for up to 4 occupants. Literally everything on this boat works as it should, with the sole exception being the fuel gauge. It tends to not give a reading until the fuel tank is at half or less. I went completely through this boat and performed major maintenance items within the past two months. Here is a list of everything I did: --Gimbal bearing replaced --Impeller replaced --Bellows inspected: no cracks, tears, brittleness, or signs of leaks. --Engine alignment verified --Fuel filter replaced --Spark plugs replaced --Engine oil/filter and outdrive oil changed --Tachometer replaced --Propeller replaced --Battery replaced --Trailer winch replaced --Smart Tabs installed This boat has never left us stranded, and always performs well. It is truly in turn-key condition, and I do not anticipate it will require much maintenance aside from routine fluid changes for the next 250-300 hours of service. The engine is strong. It starts easily, idles smoothly, shifts into and out of gear smoothly, and I’ve GPS-clocked a 43-44mph max speed at 4800rpm using a 21” pitch prop – exactly where the manufacturer says this boat should be. It sips gas cruising at about 28mph/3500rpm. The boat has always been stored under cover. The floor has no soft spots and structurally the boat is completely sound. The boat has no leaks and the bilge always stays dry unless swimmers track in water or water splashes in. Cosmetically, I give the boat an 8/10. --The seats are in excellent shape, with no tears or significant discolorations in any of the seating. There is a small (1 inch) tear on the edge of a “railing” cushion in the bow seating area; otherwise, the cushions are near-perfect. --The carpet is in decent shape for 10 years old. It does have a half-inch area near the engine box that has worn away to the underlying wood (see picture), but is otherwise fine with no major stains or odors. --The gel coat still shines and is not chalky, but it does have some discoloration from the waterline down. This is worst around the outdrive. The discoloration comes off with marine gel coat cleaner, but it tends to discolor again every few uses even with waxing because of the water in my area - so I stopped trying to clean it all the time. --Inside the glove box, the plastic insert below the radio is cracked (see picture). All I used it for was a place to store the boat registration, so I didn’t care, but it can be replaced very easily if it bothers you. --There is some discoloration around the throttle where the paint coating has come off of the plastic.--The name is affixed with stickers, not paint, so it can be removed in under 10 minutes if you don't like it. It was an inside joke between my wife and I. The trailer is in good condition and has a folding tongue to help fit it in smaller spaces. It includes a spare tire. I changed the winch recently since the original was getting pretty worn out. That’s about everything I can think of at the moment. If you have any questions or want to schedule a viewing, please do not hesitate to get in touch. I am free most afternoons. I will be happy to sea trial the boat with you provided I receive reimbursement for fuel. The boat is currently stored at a marina in Key Largo until 9/26, and will be moved to a marina in Fort Myers if unsold by 9/26. Thanks for looking! EBay disclaimer: Boat is also listed for sale locally and I reserve the right to end this auction at any time should the boat be sold outside of eBay. 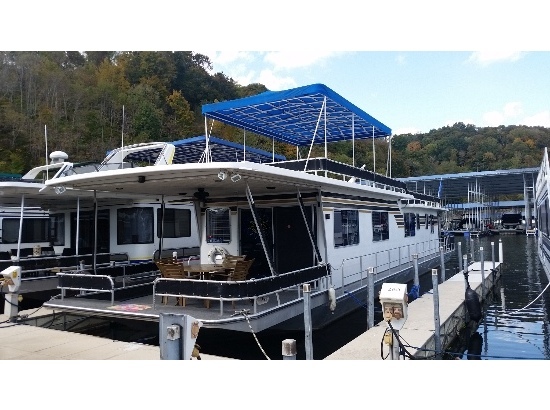 Up for sale is an extremely clean and rare 1995 Silverton 310 Express cruiser. This boat is my pride and joy and have spent many great years on her - Sadly I don't want to sell but need to consider offers because of some life changing events. There are a ton of added features, upgrades and details which I will do my best to list. The boat is currently in the water at her slip ready for a sea trial. Hull: Gelcoat and fiberglass are in great shape; All rub rails were replaced and stainless steel inserts added for protection. The aft locker door was also repaired and is not included in most of the pictures you see here; I will try to add new pictures as necessary. Motor: Motors are custom made 383 stroker engines which are also closed cooled. Mercruiser rigged with updated 14 degree dry joint exhaust risers to avoid any reversion or condensation issues. An elaborate fresh water flush system was designed to clear out ALL salt water while the engine is running - There can be no corrosion issues with any of the motor or its parts. Motors were dynoed at a true 350 horsepower and this boat will do 40+mph easily. (And yes I have the dyno sheets) Propulsion: Mercruiser Alpha Gen II's with counter rotation prop. Port skeg is broken and will need to be replaced but doesn't affect the performance at all because you have twin engines and one good skeg still. Service work was done this year and I have receipts. Prop set is 14 3/4 X 19. Electronics: Upgraded Simrad NSS 7 Radar/Fishfinder/Chartplotter was added in 2013 and I still have receipts; Raymarine A65 was also left in place to act as a single screen fishfinder with a Garmin NMEA 0183 GPS antenna. This setup rocks and the GPS signal locks on so fast that the screen doesn't have a chance to fully rasterize! Sony radio with Aux cable installed; Kenwood speakers round out the cockpit. Some planking lights need to be replaced and I will include the LEDs that I bought to bolt into the Perko units. Marine radio was upgraded in 2013 as well with GPS connection for DSC which was registered during the install. Optima batteries were purchased in 2012 and connect to a 10amp Charles type charger. There is also a fully functional and operation Kohler 6.5 CZ generator with a transfer switch and external gauges. Canvas/Cockpit Upholstery & Flooring: Canvas is in good shape and a new camper top was added in 2012. Cockpit upholstery was all redone in 2012 as well and is remarkable - All brand new. PlasTeak was added in 2013 for the cockpit floor and rounds out the look of it and adds a safety measure to prevent slipping. Below deck: All interior and upholstery was completely redone for the aft cabin, galley and vee berth; Again work is top notch and its still fairly new. Refrigerator was replaced in 2011 and there is a 16K BTU air conditioning system to provide comfort. The floor was redone with Allure in 2010. I modified the blackwater tank to incorporate a drop tube for picking up effluent and replaced ALL waste hoses and the macerator - It's done and won't be an issue for the life of the boat now. Comes with one flat screen TV with two additional brackets for flexibility or moving around. There is an extra cable coax located in the vee berth for TV viewing but you'll need to install a digital antenna. Provision breaker for an inverter has been installed in the event someone wants to add one. There is also a zinc saver installed with a connection monitor for both 30 amp service connections. Other Notes: Washdown pump and quick connects were installed located on the bow and stern for easy washing/rinsing; No more dragging a long hose around. Retractable vent hatch - EXTREMELY IMPORTANT... anyone who knows this model should be aware that Silverton made a mistake by leaving the vent cover open to rain. This "rain" will lay on top of your port motor and seep into carburetor. Once you try to start, you find out the hard way that water doesn't compress - I took it upon myself to correct this flaw. I mentioned that you will need to replace the port skeg on the outdrive; You will also need to eventually replace the hot water tank. The fresh water pump and connected tank should be cleaned or replaced; The fresh water tank is about 35 gallons and the blackwater tank 28 gallons; No leaks. Has a windlass but you'll need to invest in a good anchor and rope/lead as it does not have one. It also has a new refrigerator located in the cockpit. Swim platform has a ladder and is in good shape showing no nicks, scratches or damage you'll need to worry about. I am also including the trailer in this auction because it was really bought and designed for this boat. I don't think anyone will find a boat this clean with the total amount of additions that were installed. I've yet to see any Silverton like mine so to me it's one of a kind. Disclaimer: As with any EBay listing, I've tried to describe everything about this vessel to the best of my knowledge. I would encourage anyone that is serious to see the vessel for themselves - I am not afraid of a sea trial and am confident it will pass with no problem. This vessel is being sold "as is" and doesn't include any warranty or refunds once the sale is final. It has a clear NJ title along with the trailer.